REFUGEES EN ROUTE to the United States have been detained at airports after President Donald Trump signed an executive order barring all refugees from entering the US for three months. Those from war-ravaged Syria will be banned from entering the country indefinitely. Trump said the ban is necessary to prevent “radical Islamic terrorists” from entering the nation. Cairo airport officials say seven US-bound migrants — six from Iraq and one from Yemen — have been prevented from boarding an EgyptAir flight to New York’s JFK airport. The officials said the action by the airport today was the first since Trump imposed the ban on refugees from seven Muslim-majority countries: Iraq, Syria, Iran, Sudan, Libya, Somalia and Yemen. The New York Times reports that the detentions have prompted legal challenges from two Iraqi refugees held at JFK Airport. Their lawyers want them released and also filed a motion for class certification, in an effort to represent all refugees and immigrants, who they said were being unlawfully detained at ports of entry. The head of a leading refugee aid agency has said Trump’s decision hurts innocent people fleeing violence. Jan Egeland of the Norwegian Refugee Council said the move “will not make America safer, it will make America smaller and meaner”. Egeland said the decision dealt a “mortal blow” to the idea of international responsibility for those fleeing persecution. He says the US is leading a “race to the bottom” in which politicians in wealth countries provide “zero moral leadership”. The executive order signed by Trump yesterday immediately suspended a programme that last year resettled to the US roughly 85,000 people displaced by war, political oppression, hunger and religious prejudice. Trump indefinitely blocked all those fleeing Syria, where a civil war has displaced millions of people, and imposed a 90-day ban on entry to the US from seven Muslim-majority nations. Trump said the halt in the refugee programme was necessary to give government agencies time to develop a stricter vetting system. But the order did spell out what additional steps he wants the Homeland Security and State departments to take. The US may admit refugees on a case-by-case basis during the freeze, and the government will continue to process requests from people claiming religious persecution, “provided that the religion of the individual is a minority religion in the individual’s country”. The order was signed on Trump’s most robust day of national security and foreign policy at the start of his presidency, marked by a meeting with British Prime Minister Theresa May and a lengthy phone call with Mexican President Enrique Peña Nieto. As a candidate, Trump called for a temporary ban on all Muslim immigration to the US. He later shifted his focus to putting in place “extreme vetting” procedures to screen people coming to the US from countries with terrorism ties. The Council on American-Islamic Relations, or CAIR, said it would file a federal lawsuit on Monday challenging the constitutionality of the executive order. Trump, according to the executive order, plans to cut that to 50,000. Refugee processing was suspended in the immediate aftermath of the September 11 attacks and restarted months later. “Tears are running down the cheeks of the Statue of Liberty tonight as a grand tradition of America, welcoming immigrants, that has existed since America was founded has been stomped upon,” Senate Minority Leader Chuck Schumer said. The president’s directive capped a hectic first week for Trump at the White House, giving Americans an initial look at how he intends to position the US around the globe. Earlier on Friday, he hosted May at the White House for his first meeting with a world leader since taking office. Asked about whether he would revert back to Bush-era use of torture, Trump said he would defer to the views of Defense Secretary Jim Mattis. 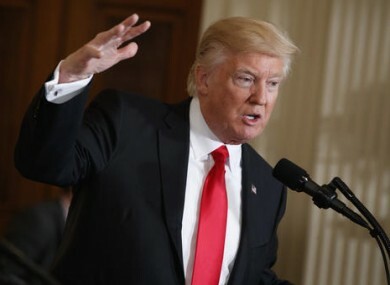 The Associated Press and other news organisations have obtained copies of a draft executive order signaling sweeping changes to US interrogation and detention policy. The draft, which the White House said was not official, also requests recommendations on whether the US should reopen CIA detention facilities outside the United States. Critics said the clandestine sites have marred America’s image on the world stage. Trump held firm yesterday on another controversy — trade and illegal immigration from Mexico. He told reporters he had a “very good call” with Peña Nieto earlier in the day, but he reaffirmed his belief that Mexico has “outnegotiated and beat us to a pulp” on trade — and that would change. Email “Refugees detained at airports after Trump bans them from entering US ”. Feedback on “Refugees detained at airports after Trump bans them from entering US ”.